70s/80s children's comic about a green ghost/alien and his young human friend? Can't remember much else. The creature or ghost is green and cute, and the human is (I'm pretty sure) a boy. It's not My Pet Monster, Slimer from Ghostbusters, Casper in the wrong color, or Doop from Marvel. 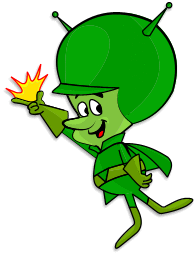 Shot in the dark, but perhaps The Great Gazoo (from the Flintstones)? Had his own comic book series from 1973-1977. Not the answer you're looking for? Browse other questions tagged story-identification comics aliens or ask your own question. Late '70s / early '80s Comic With Lizard and Woman in Wasteland?